The Reps have their moral leader back on time for 2006 and 2008. Karl Rove managed to ruin his 2000 campaign but Senator John McCain once again proved how great he could be as the commander-in-chief. His amendment specifying no "cruel, inhuman, or degrading" treatment should be performed by the US against detainees puts the Commander-in-thief in front of a dilemma : if I veto the bill (since, as McClellan put it, it "would limit the president's ability as commander-in-chief to effectively carry out the war on terrorism"), I may have to renegociate a $400bn check. If I don't veto it, I'm losing the face as a commander-in-chief. McCain said : "The enemy we fight has no respect for human life or human rights. They don't deserve our sympathy. But this isn't about who they are. This is about who we are. These are the values that distinguish us from our enemies." How about Saddam's trial ? Saddam Hussein's trial is only about who he is, not about who we Western democracies are : the only charge is about a massacre of villagers. Relevant, but nothing about gassing the populations (with gas manufactured in Germany or in Iraq with French & US facilities). Nothing about the ugly war against Iran (sponsored by the US and "old Europe"). Nothing about the post Gulf War I retaliation on Kurds (abandonned by Dubya's father). Nothing about the honoris causa Doctor Hussein behind the evil Mister Saddam. A couple of months ago, French soldiers would try to cover up an incidental death in Ivory Coast : as soon as the Government understood it, they suspended the general in charge of the whole operation in the country. Just days later, the US DOJ decided not to charge CIA felons for the institutionalized abuses in Iraq and Afghanistan*, considering enough people paid. Only low rank soldiers have been charged but everybody knows who's responsible for the Abu Ghraib and Salt Pit infamies ; the man who even wrote down in memos his vision of an Amerika refusing the Geneva Convention and embracing torture ; the man George W. Bush put at the very head of the Department Of Justice. You don't want to stir bitter feelings among CIA people these days. So Attorney General Alberto R. Gonzales decided not to sue Senior Adviser Alberto R. Gonzales. Shame, shame, shame ? Not really : this mob keeps talking about the pride of defending Freedom and Democracy against fascism. Lynnie England definitely found her master in sick jokes. The scapegoat has eventually been found : he is Karl Rove's boss and no decision is taken in the White House without his knowledge. This powerful leader must quit at once. Andrew H. Card Jr is responsible for everything*, from the disastrous handling of Katrina to the surrealistic nomination of Harriet E. Miers. He is certainly the one who said there were WMDs in Iraq and for all we know, he could even have shot JFK. So the great decision maker who spends less time finding a scapegoat when he's under attack than reading "my pet goat" when his country's under attack, the great thinker who writes down such powerful memos as the now famous "I think I may need a bathroom break. Is this possible ? ", The Great King Dubya, Lord of the Banana Republic of the Divided States of Amerika, will once again prove his wisdom and his character : He will fire His Chief of Staff or rather dis-Card him. God bless Amerika and someone bring me a barf bag. Last January, I already blamed the First Amendment for allowing the American National Socialist Movement (a.k.a. America's Nazi Party) to exist an even become a sponsor for the Adopt-A-Highway program. Now Toledo, OH allowed this mob to march proudly through the city, provoquing a riot and even a curfew. As a result, more publicity than these Nazis could ever dream of - not to mention my blogules. When I said "let's face it, they're fascists" last year, I was just noticing the similarity between the Mussolini definition of fascism and the Bush Administration's (ab/mis/)use of power. I knew Dubya's reelection would free the darkest sides of Amerika but never did I expect America's Nazi Party to become that bold. Just a few days ago, Bush would mention for the first time "fascist islamists / fascist islamism". He didn't invent the expression, which perfectly suits the worst part of radical islamists. But still it shocked me to hear Bush using this kind of vocabulary at this stage. Now I know it was a clear signal. We're raising the level of terror threat, but we're also raising the level of permissivity. You may not have the toughest fundamentalist nominated for the Supreme Court, but be sure the country is yours. After Ripley's Believe It or Not!, Dubya's visit it or bust. A new Bush museum will open in 2007 in the house 41 & 43 inhabited for 3 months back in 1949. The owner, a Republican, intends to add a reading center for kids in the backyard. No doubt the cornerstone of 43's Prez Library... that is, unless the College Station, TX based Bush The Elder's Presidential Library decides to keep "My Pet Goat". The royal family enjoyed sunny California as well as Yankee New England : Bakersfield, CA hosts California State University and a few country clubs. Back then, Coast-to-Coast Dubya wasn't a newborn Texan yet but the Official Propaganda already unhearthed a couple of pictures of the young John Wayne lookalike dressed in a cow boy suit. They're supposed to refurbish the place the way it was in the late forties. I suggest to spray some petrol around to make it even more realistic. 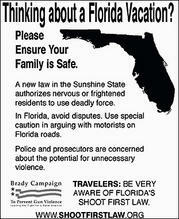 Remember this excellent ad sponsored by the Brady Center to Prevent Gun Violence ? Well. One week after its publication, theShootFirstLaw.org website is down... or should I say it's been Hammered down ? I would then pay a well deserve tribute to a former NRA president, Marion P. Hammer, now head of Unified Sportsmen of Florida and the main lobbyist behind this amazing law signed by Jeb Bush last april ("44" proudly declared the so called "Castle Doctrine" a "good, common sense, anti-crime issue"). The crime is to let these gangsters run the country. The Far West is heading further to the extreme right and still no sheriff in sight. And where on Earth are the Dems ? They should be the ones shooting on sight : consider what a Rove could do with all the material this excuse for an administration delivers every day, how come no Dove is able to expose it ? Rainbow Warrior was the name of the Greenpeace ship sunk by the French intelligence service as the organization tried to reach the site of nuclear tests, about 20 years ago. Rainbow warrior is the name of the sinking US president as he tries to reach a more decent approval rate by raising both fear and the US Department of Homeland Security's threat level from Green to Blue to Yellow to Orange to Red*. Neither Greenpeace nor Bush did swallow Dr. Mohamed ElBaradei's Nobel Price, the IAEA promoting from the start civil nuclear energy and its leader contesting from the start the existence of WMDs in Iraq. Yesterday, you had to see Greenpeace leaders go nuclear and Dubya turn green... Now that's quite a weird association. And considering the intensity of the attacks on a former Nobel duet (the UN & Kofi Annan), ElBaradei could be considered an endangered specie. * Is Amerika Ready ? For those feeling nostalgic for the McCarthy era, enjoy the government's website devoted to readiness. Coming soon after Ready Business and Ready America : Ready Kids. After Katrina, I guess they're working on Ready Pets as well.